Noah Bressner/Editor-in-Chief Li Xi, a second-year graduate student studying cartography and geographical information systems, won the 2017 SUNY Chancellor’s Award for Student Excellence. When Li Xi visits a new country, she’s not only interested in the culture, but also the physical geography of the area. 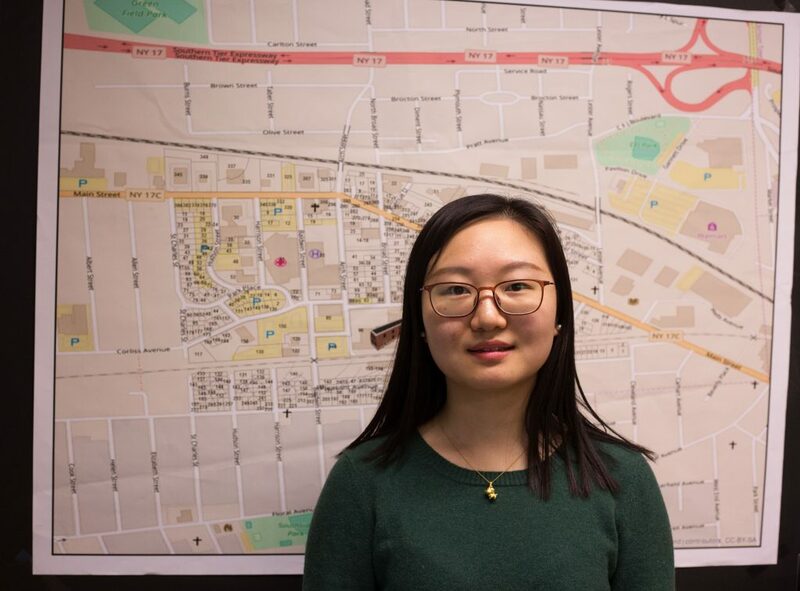 Now a second-year graduate student studying cartography and geographical information systems, Xi has been able to turn that affinity into a future career. A native of the Jiangsu province of China, Xi began exploring this love during high school through her earth science courses and the Harpur College University Readiness Program (URP). URP is a collaboration between Binghamton University and Chinese high schools that gives students the opportunity to take online courses taught by University faculty. In 2012, when Xi was in 11th grade, she, along with other students at her school, were introduced to URP during a visit to the University. Over the past six years, Xi has spent her time learning both in and out of the classroom. She’s interested in American culture and often spends her breaks with her friends and their families. Last spring break, she went home with her friend Jan’Meshier Frye, who is now a senior majoring in linguistics from Mississippi. Xi had never been to the South, and although she had a hard time understanding the dialect, she enjoyed herself. While Frye has helped Xi understand more about African American culture, Xi has taught Frye about Chinese culture. Xi values these interactions and thinks they are a great way to learn. As a way to share her Chinese culture, Xi was a member of the Confucius Institute of Chinese Opera while she was an undergraduate. The organization was formed by BU and the National Academy of Chinese Theatre Arts, sponsored by the Confucius Institute Headquarters in Beijing. Xi plays the pipa, a four-stringed Chinese musical instrument with a pear-shaped wooden body. She has been playing since she was in the third grade. It’s this discipline that has helped Xi get to where she is today. Last April, Xi was awarded the 2017 Chancellor’s Award for Student Excellence, a SUNY-wide distinction that recognizes students for their outstanding academic achievement, leadership and community service. A self-described environmentalist, Xi would like to eventually receive her doctorate in geography and use research as a tool to fight climate change. Her current research examines the rate of urban expansion in Southeast Asia and how the creation of impervious surfaces — land that water can’t penetrate through, like sidewalks — affects the environment. Xi has visited areas throughout China, Japan, Singapore, Korea, Australia, Mexico and the United States. Though she enjoys exploring new cultures, she has no preference as to whether her professional life takes her around the globe, or keeps her in Binghamton. “As long as my research contributes to any part of the world, I will be very happy,” Xi said.